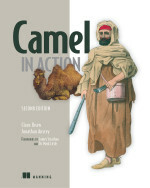 Shoutout to @davsclaus & #Camel riders! Just added a reflection upon the last 5y on this SO question: https://stackoverflow.com/questions/3792519/apache-camel-and-other-esb-products/34818263#34818263 …. Have a look! The tweet refers to an old question on stackoverflow about the Apache Camel versus other ESB, and this question is in particular about Camel vs Mule. The question was asked in September 2010, and now fast forward 5+ years Raul took a look at the situation today. I think his detailed answer is worth attention for users of Camel, and others who are doing assessment on integration software. I think Raul has some major points to point out about the difference between Camel and Mule. An maybe overlocked fact is that the branding and marks of Apache Camel belongs to the ASF foundation. So no commercial company can "take the brand" and run with it. Neither Red Hat or Talend etc. can create a product called Red Hat Camel, Talend Camel ESB etc or some variation of the project name. Apache Camel is the authentic project. Other projects may encounter such a problem. For example docker is very famous brand today, and there is no neutral foundation that owns that brand, the brand is owned by docker.inc (the company). So IMHO there is an interest of conflict with the brand name and docker.com the commercial company. Another important aspect of Apache Camel (and ASF projects) is that there is no open-core/community vs enterprise model. At Apache Camel we would never deceive the community, for example by learning which Camel components that are the most popular and remove the source code from the community version and put that under a different license in a closed-source enterprise only product. And a final note Its also worth referring people to the previous blog, which also spun from a tweet where you can easily compare projects on blackduck, such as Camel vs Mule. 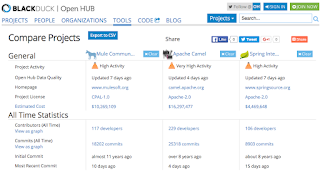 With Apache Camel it is all about the community, for the community, and all work is done in the open. Anyone can participate and we love contributions. Roll on 2016 its going to be another great year for the Camels.